In the region around Hanoi in Vietnam, an important, but long forgotten, battle was being waged. In the second attack of his general counter-offensive, Vietnamese General Vo Nguyen Giap targets a French outpost near Haiphong in what becomes known as the Battle of Mao Khe. After days of bloody, sometimes hand-to-hand, fighting Giap withdraws. Viet Minh troops suffer a pounding from French naval gunfire and air strikes. French napalm once again wreaks havoc on the attacking Viet Minh. 3000 Viet Minh are killed…. In five years General Giap had taken a rag-tag group of guerrillas and transformed them into whole divisions 10,000 strong. Understandably over-confident, he planned to capitalize on his momentum by taking it to the French in the Red River delta. But the French had a new commander who would have his forces ready. The French would get their wish– a series of set-piece battles. January 13, 1951 – 20,000 Viet Minh under Gen. Giap begin a series of attacks on fortified French positions in the Red River delta (extending from Hanoi to the Gulf of Tonkin). The open areas of the delta, in contrast to the jungle, allow French troops under the command of General Jean de Lattre to strike back with devastating results. French troops fight on the ground from cement bunkers that comprise the new ‘De Lattre Line’ which encircles the region. French planes use napalm against Viet Minh human wave assaults. 6000 Viet Minh die while assaulting the town of Vinh Yen near Hanoi in the first attack, causing Giap to withdraw. 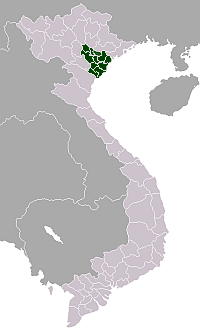 May 29-June 18 – Giap makes yet another attempt to break through the De Lattre Line, this time in the Day River area southeast of Hanoi. French reinforcements, combined with air strikes and armed boat attacks result in another defeat for Giap. Thousands more of his troops are killed and wounded. Among the French causalities is Bernard de Lattre, the only son of General De Lattre.